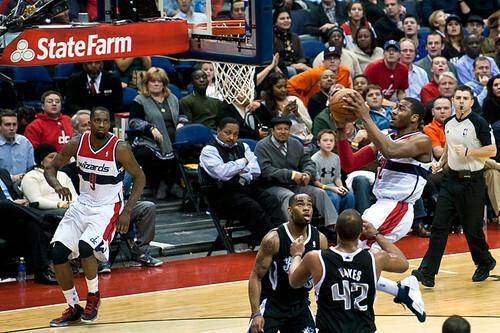 Monday night I headed to the Verizon Center to cheer on one of the local sports teams. As you might expect, that’s not all that unusual. But I wasn’t there to take in a Washington Capitals. Instead, for the first time in a long, long time, I was there to see the Wizards in action. Unless I’m mistaken, the last time I attended a Wizards game, they were a mediocre playoff team led by the trio of Gilbert Arenas, Antawn Jamison and Caron Butler. Need to say, none of the current players on the Wiz roster were on this squad back then. 1. This team is clearly nothing without point guard John Wall. With him, the Wizards were easily the worst team in basketball — going just 5-28 in the 33 games Wall was sidelined while recovering from a stress injury to his left knee cap. Since his return, Washington has gone 6-4 and has actually been competitive every single night. The same holds true, albeit to a lesser degree, during individual games. Wall is a dynamic player with speed most players can only dream of, so when he’s pushing the ball up court in a hurry, it often times leads to easy buckets for the Wiz. Without him prominently involved though, Washington’s offense is a lot less formidable and often times struggles to score with any level of consistency. 2. That being said, center Emeka Okafor was the best player on the court for either team Monday night. The big man with the big contract scored a game-high 23 points, hauled in a game-high 15 rebounds and finished the night an impressive +19 in plus/minus. It should be noted, Okafor’s 23 points also represented a season high for the eight-year pro. While more than a few folks aren’t thrilled that the 30-year-old center is taking up such a huge chunk of salary cap space with his $13.49 million salary this season, Okafor will quiet a lot of skeptics if he continues to play this consistently moving forward. 3. The player I was most excited to see on this night was rookie guard Bradley Beal. Earlier this month, Beal lit up Sacramento for 26 points while draining six of seven three pointers, so I admittedly went into this contest with high hopes. Unfortunately, the 19-year-old got into foul trouble early and never got into any sort of rhythm — finishing with just six points and three assists. 4. Forward Martell Webster might be the least heralded starter in the Wizards lineup, but the guy knows what he brings to the table and is more than capable of contributing. Against the Kings, the seven-year pro scored an efficient 18 points on six of nine shooting and finished the evening with the team’s second-best plus/minus (+7). 5. Fair or unfair, I’m just not a fan of forward Trevor Ariza. I don’t see him bringing anything special to this team, which wouldn’t be such a problem if he wasn’t scoring just 7.2 points per game while making $7.2 million this season. Washington offense stalled every time he took the court, which explains how he finished the game an embarrassing -11. 6. Kings point guard Isaiah Thomas is generously listed as 5-foot-9, and yet, he came up big against the Wizards — with 22 points, seven assists, four rebounds and the game-winning shot. For such a little guy, he sure did seem to be able to get high percentage shots off as often as he wanted, which is probably not the defense Wizards coach Randy Wittman drew up to try and stop Thomas. 7. If the Wizards weren’t able to land Beal in the draft last year, I was hopeful they’d select power forward Thomas Robinson. His numbers weren’t anything special against Washington (nine points, three rebounds and two blocks in 28 minutes), but I’m a fan of his game. 8. Small forward Jan Vesely and I played the same number of minutes against Sacramento Monday night. One of us is a lottery pick. One is a beer drinking blogger. 9. I admittedly don’t know who guard Garrett Temple is, but having him prominently involved in the final play of the game after riding the bench all night long was probably not the smartest decision Wittman has ever made. 10. Even though the Wizards lost the game and therefore snapped their five-game home winning streak, I’d go back to see them again. Their record still isn’t very good, but at least they’re playing hard and there are a few pieces in place for the day this franchise turns the corner towards respectability. Tickets are reasonably priced and aren’t in high demand, so I’ll probably be back again sooner rather than later. And for those who are interested, here are my favorite photos I was able to capture from the Wizards-Kings game.